Keeping your garden constantly flawless is backbreaking and time-consuming work. 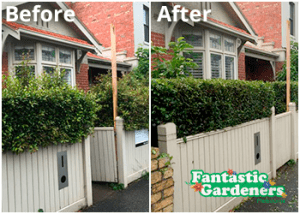 Fantastic Gardeners Melbourne is here to take that burden off your back and apply the specialist yard care that your garden deserves. Get back the hours of hunching over garden beds, pushing the lawnmower, or circling hedges with the garden shears and use them for yourself! Get ahold of the gardening professionals and let your yard thrive with our garden maintenance. The Garden Maintenance Package that has it all! Lawn mowing and green waste removal are both included in the package. We will apply our lawn care expertise to keep your turf areas sprightly and neat, and when the job is done we will take care of all the green waste. Unless you want to compost it, of course. Furthermore, you can take advantage of our tree services, too. You can count on us for the full range of garden maintenance services like irrigation, hedge trimming, weeding, replanting, mulching, leaf clearing, fertilising, and whatever else your garden may need. If you don’t see the yard care service you need, just give us a call and ask the operators! Our services are designed with the client in mind so you can fully tailor it to your liking and needs. Besides, we’ll give you a free quote on the price beforehand. Australian soil is sometimes hard to work with. Which is why fertilizing twice a year is suggested – in spring and autumn. Keeping the soil well stocked with nutrients is essential for a lush garden. We work with both organic and chemical fertilizers so we can suit you and your garden best. Hedge trimming is a deceptively simple service that can potentially dictate the feel of your entire property. When properly carried out it can make your entire home look tidier and luxurious. Mulch is organic or inorganic material that is applied to the base of your plants to contain weed growth and improve moisture retention. Organic varieties of mulch will even improve the fertility of the soil as they break down with time. The types of mulch are many and we’ll gladly help you choose the best for your garden.